Until now, I’d never made caramel corn before. It’s surprisingly easy, at least if you don’t have any reservations about working with hot bubbling caramel. I’m not sure why, but whenever I make caramel-based stuff at home, I space out and start out using too small of a pan. Just for reference, boiling hot sugar spilling over in a pot all over your stovetop isn’t a fun time. Once I had everything in a larger pot, I set it back on the (now scrubbed clean) stovetop and was good to go! So, grab a large pot and let’s make some caramel corn, shall we? Start out by grabbing a sheet pan and laying some parchment paper down on it, and finding the largest, deepest bowl you have in your kitchen. Spray the bowl lightly with cooking spray or rub it with oil or butter, and set it aside. If you’re starting out with unpopped popcorn kernels, the easiest way to pop them is to use an air popper. Just pop them according to how the manufacturer suggests, or you can pop them in a large pot on the stovetop with a little bit of oil. Try and pick out the stray unpopped kernels if you wish, put the popcorn into your waiting large bowl and set it aside. In a large pot, stir together the granulated sugar, brown sugar, corn syrup, honey, water and butter. Set the pot over medium heat and let the ingredients come to a boil. Continue to cook over medium heat, stirring occasionally with a wooden spoon, until the temperature of the caramel hits 300 degrees/hard crack stage (It took about 22-23 minutes for my caramel to hit 300). Remove the pot from the heat and stir in the baking soda and salt with your wooden spoon. Carefully but quickly, pour the caramel over the popped popcorn. 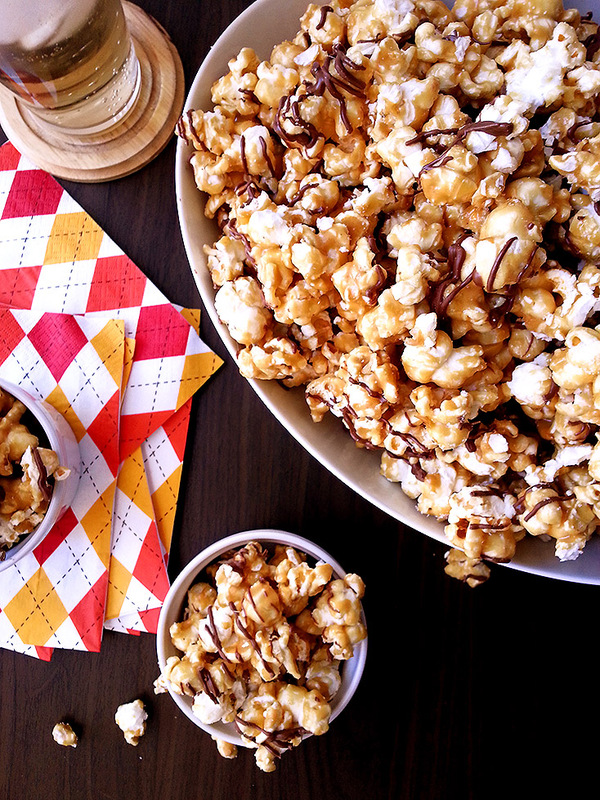 Using two large spoons, toss the popcorn carefully to get it totally coated with the caramel. Be careful, this stuff is HOT! I accidentally gave myself a pretty gnarly burn on my left hand because my mixing bowl was not big enough, and I used my bare hand to prevent some molten caramel-covered popcorn from spilling over the side. I won’t make that mistake again! Please, be smarter than me. Once the popcorn is all covered in the delicious caramel, dump it out onto your waiting sheet pan and spread it out gently with your wooden spoon. Make sure to get as close to one single layer of caramel corn as you can, as this will make breaking up the popcorn easier. Now, it’s chocolate drizzling time! Melt your chocolate in the microwave on high for 30 second intervals, stirring in between. My chocolate only took about one minute to fully melt but the bowl I was heating it in was a very good conductor of heat, so the residual heat of the bowl melted the chocolate most of the way. When the chocolate is all melted, transfer it to a disposable pastry bag/ziploc bag with the corner snipped off, and drizzle it over the caramel corn in a zigzag pattern. Or, you can just drizzle it on with a spoon! Let the caramel corn sit in a cool place for at least a half hour. If the chocolate is not fully set by that time, set the pan in the freezer for a minute or so. When the caramel and chocolate are fully set, carefully break apart the pieces by hand. Serve it up in a big bowl to your Super Bowl party guests, or store it in an airtight container at room temperature to serve up later, if you want to make it ahead of time! It stores beautifully at room temperature for about a week, that is, if there’s any of it left after your guests gobble it up. It’s the perfect thing to temper all that savory, spicy party food! I’m so impressed by the taste of this caramel corn. The honey adds just the perfect subtle flavor, without overwhelming the rest of it. The chocolate mellows it out a bit, and there’s also that underlying saltiness that complements the whole thing really well. I honestly think that dark chocolate would have been a better choice to stand up to the caramel flavor, but I’m more of a milk chocolate fan so that’s what I went with. If dark chocolate is your favorite, by all means, use it! You could even leave it plain if you want. It’ll be delicious either way! If you missed it yesterday, check out my mini taco salad cups, perfect for your game day parties! Reblogged this on Pinterest: Pass or Fail.